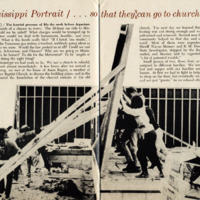 Mary Miho, an Oberlin student who went to Ripley, MS with the other Carpenters for Christmas, wrote this article about her experience for Youth magazine, published by the United Church of Christ in 1965. The article, entitled "Mississippi Portrait," includes photographs by major press outlets such as the Cleveland Plain Dealer, United Press International, and AP/Wide World. Mary Miho, "Mississippi Portrait," Youth Vol. 16, No. 4, February 14, 1965, pp. 10-17. Oberlin and Civil Rights Collection (RG 30/427), Oberlin College Archives. Miho, Mary (Class of 1968), “Article by Mary Miho, Class of 1968,” The Oberlin Sanctuary Project, accessed April 24, 2019, http://sanctuary.oberlincollegelibrary.org/items/show/94.